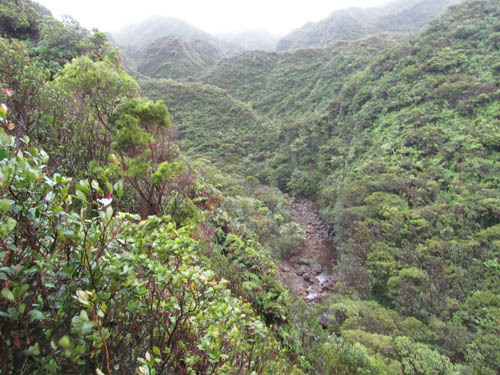 We hiked up Papali Ridge to drop down into the upper reaches of Kaluanui Stream above Hauʻula and the Koʻolauloa Coast of windward Oʻahu. 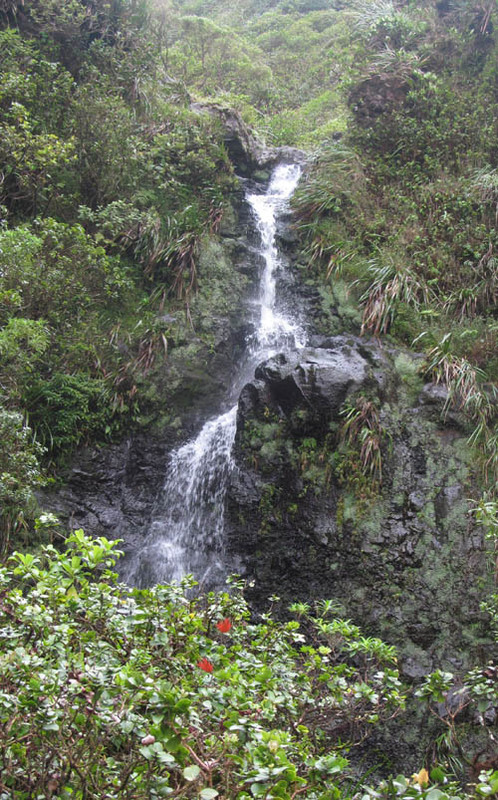 John Braum, Clayton Kong, Baron Yamamoto, Cory Yap and I went to explore the hanging valley above Kaliuwaʻa (Sacred Falls) which cannot be directly accessed from sea level due to steep canyon walls carved into the mountain over which a series of tall waterfalls plunge. So we took a long circuitous route from the end of Hauʻula Homestead Road and hiked up Maʻakua Ridge Trail. Pushing off at first light, we made our way up several switchbacks through groves of invasive christmas berry and formosan koa to gain the top of the ridge. 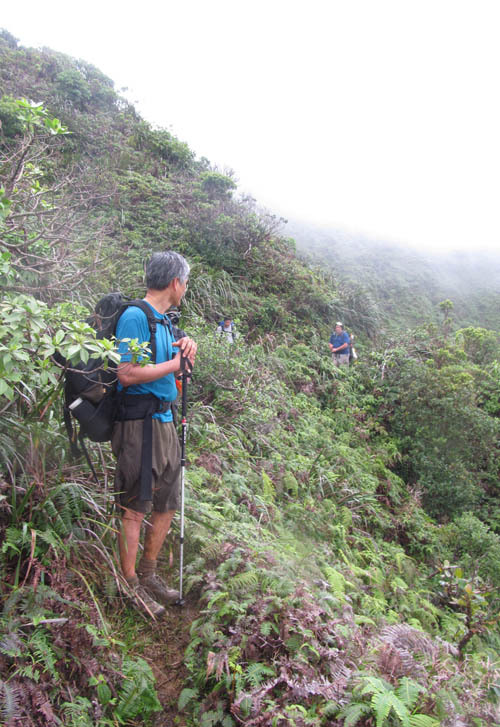 When the Maʻakua Ridge Trail turns off the ridge, we left the State trail by continuing up the ridge line to venture further mauka where the vegetation becomes much more native. 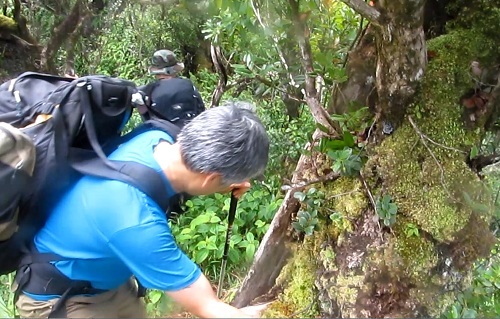 We made our way past a number of large ʻōhiʻa trees covered with mosses, ferns, and ʻieʻie vines as we gained elevation on the ridge top. 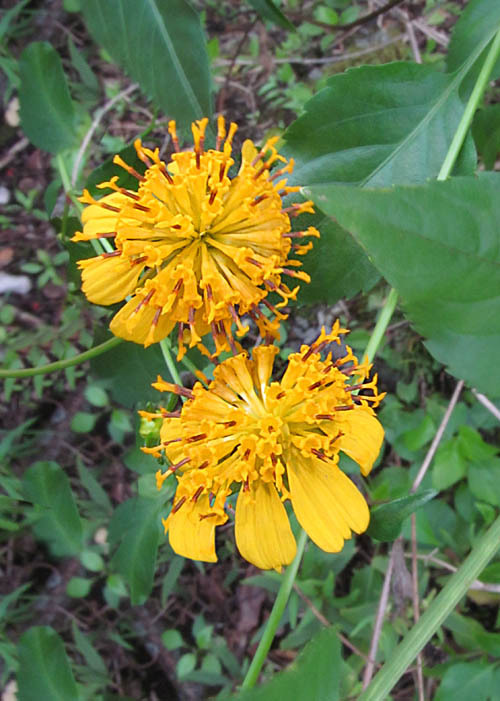 One of the more interesting sights along the trail was an unusual form of koʻokoʻolau (Bidens campylotheca) whose compound flowers are comprised of dozens of tiny little flowers that form a ball-like dome. When we reached the saddle, we descended and then climbed back up to regain the elevation we had lost huffing and puffing all the way. 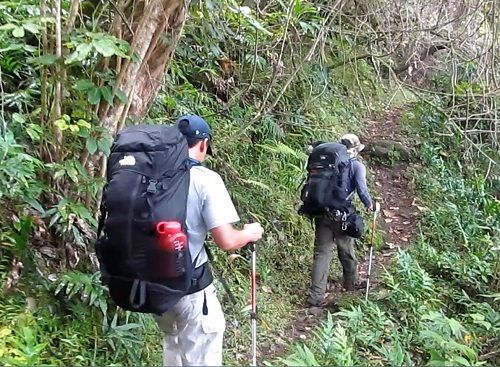 But we were lucky that the wind kept us cool as we continued our mauka climb to the junction with Waiʻahilahila Ridge and the Kamapuaʻa Trail at about 1,900 feet elevation. 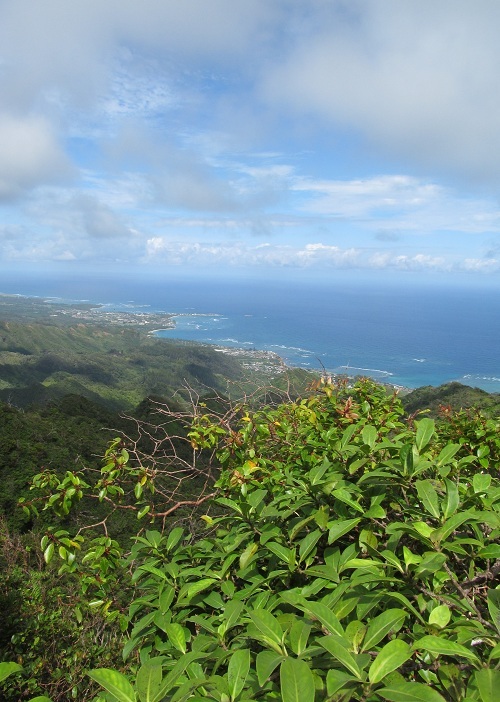 We had a commanding view of Hauʻula, Laʻie Point, and the Koʻolauloa Coast as we climbed up Papali Ridge from peak to peak gaining further elevation. Clouds blew in and soon the ridge tops were shrouded in a cold wet mist. When we reached about 2,400 feet elevation, we stumbled on a koliʻi (Trematolobelia macrostachys) that had multiple sprays of flowers. 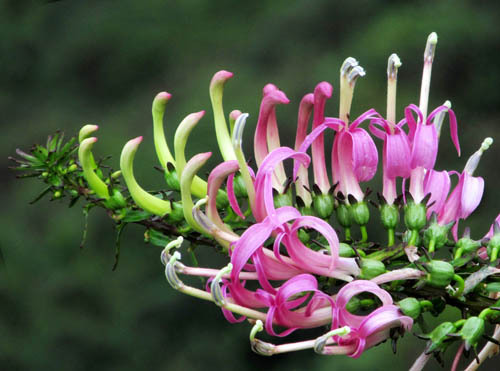 Each spray had several dozen flowers which open just a handful at a time starting from the inner most part of the stalk working their way to the tip. We admired looking up close at the irregularly shaped petals. What a spectacular sight! When we reached the junction with the Castle Trail we were thrilled that we could see our destination — upper Kaluanui Stream! We wasted little time on the contour trail and dropped down from Papali Ridge into the hanging valley carved by the stream. Clouds tickled the mountain tops as we descended the contour trail into the hanging valley. 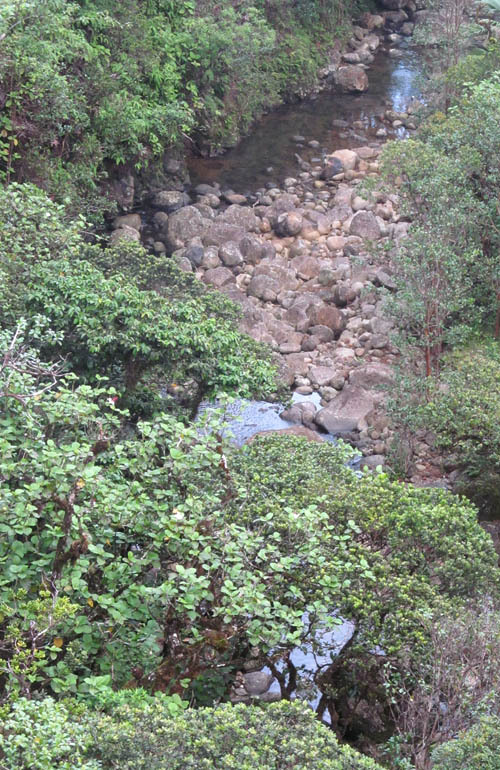 Many thanks to the trail clearing efforts of the Hawaiian Trail and Mountain Club, the Castle Trail was wide open and we made good time dropping down to the stream at about 2,000 feet elevation. When we reached the stream, wind blew down the entire length of the valley and it was cold. I parted ways with the group who headed downstream to see the waterfalls. Since I had previously explored downstream and I opted to head upstream instead to see what kind of native plants and animals I might encounter. One of the more amazing creatures were small ʻopae kalaole or mountain shrimps (Atyoida bisulcata) about an inch long who undergo a fascinating life cycle. 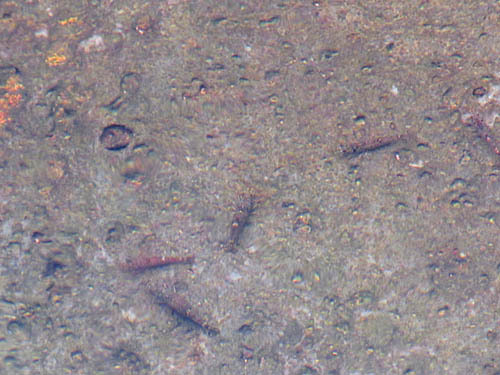 ʻOpae mate and lay their eggs in the stream whose larvae hatch and are washed down stream into the ocean. After spending a larval stage in the ocean, they migrate upstream and climb multiple waterfalls — some of them several hundred feet tall — to reach this hanging valley 2,000 feet up in the mountains! 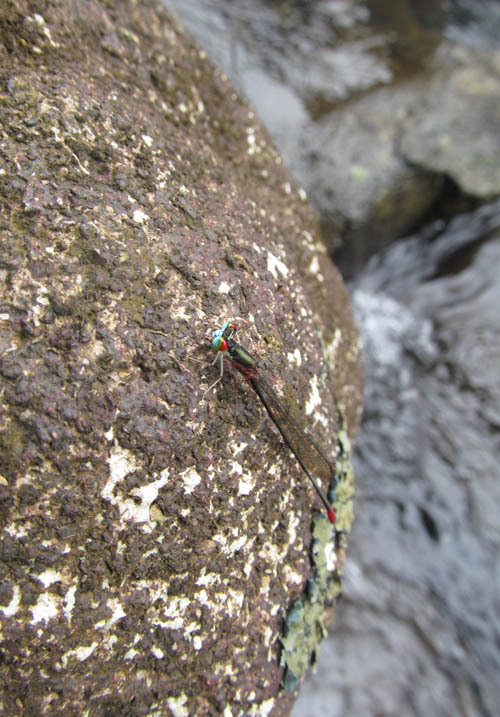 While hopping from from rock to rock in the stream, I saw a number of pinao or native damselfies (Megalagrion sp) which darted about the stream. They were mostly black in color but had curious looking eyes that were half blue and half red. They also had a long segmented abdomen that was mostly black but red at the tip. 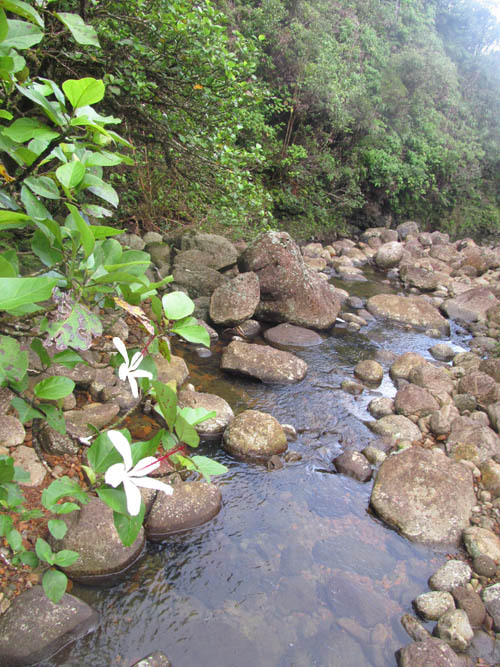 Many kokio keʻo keʻo or native hibiscus trees (Hibiscus arnottianus punaluuensis) grew along side the stream. 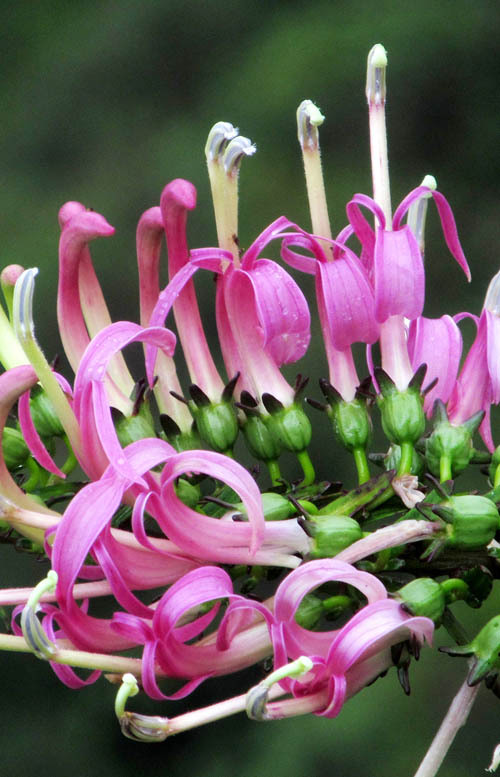 I was pleased to see a number of them in bloom with large white flowers 4-6 inches across with pinkish red stamenal columns. 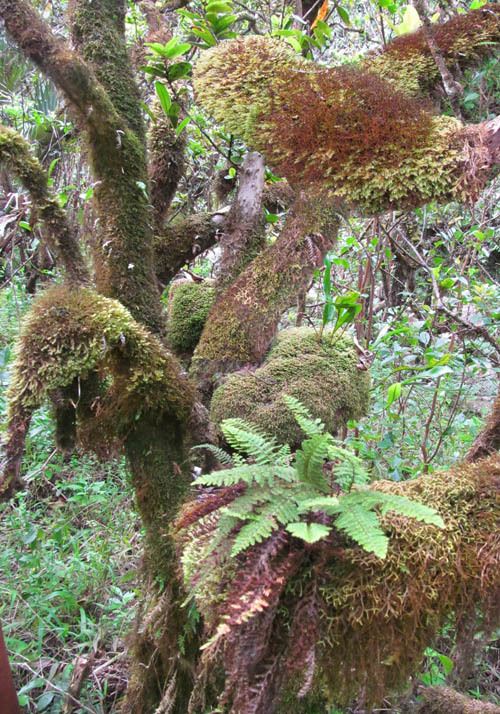 Some of the ʻōhiʻa trees along the banks of the stream were just covered with a profuse growth of shaggy mosses and cute little ferns. When I turned over the curled over leaves of alani (Melicope sp. 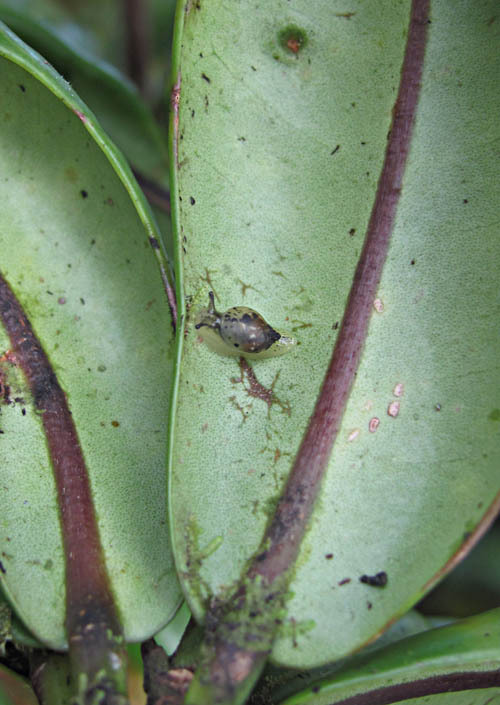 ), I saw a number of cute little pupu kuahiwi — succineid snails — which seek shelter on the underside of leaves. The stream meandered around multiple bends as I rock hopped for quite some distance. I ventured up a couple of tributaries that fed the main stream and came to a cascading waterfall about 35 feet tall. After admiring a large pilo (Coprosma sp) tree at the base of the falls, I found a way to climb up the waterfall and made my way further upstream. 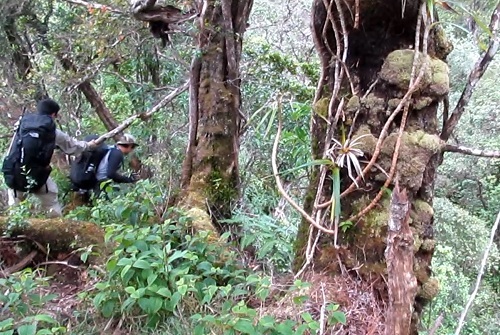 One of the more unexpected sights was a koliʻi growing as an epiphyte on a large ʻōhiʻa tree along the stream. 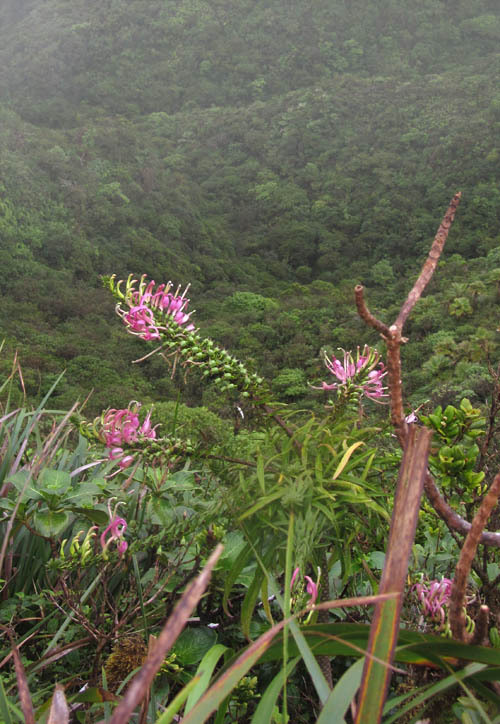 Its flowers were a much paler shade of pink than the other koliʻi we had seen on the ridge top earlier in the day. 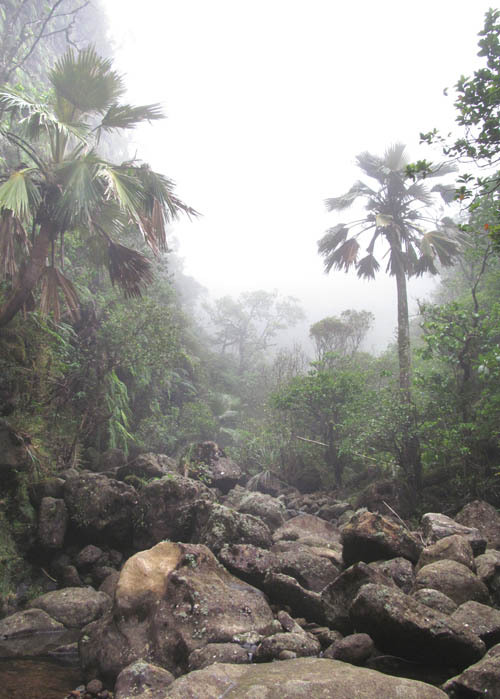 Clouds dropped down to fill the hanging valley with a cold eerie mist and rain fell from the skies. 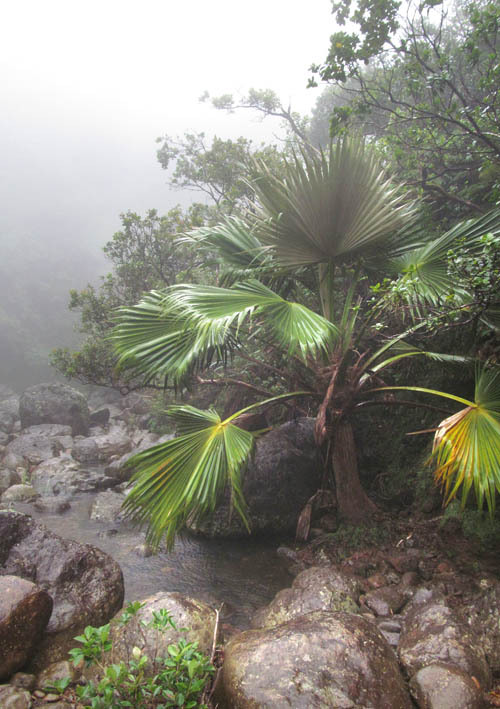 But the rain did not last long and I pushed onwards admiring the many loulu palms (Pritchardia martii) along side the stream. 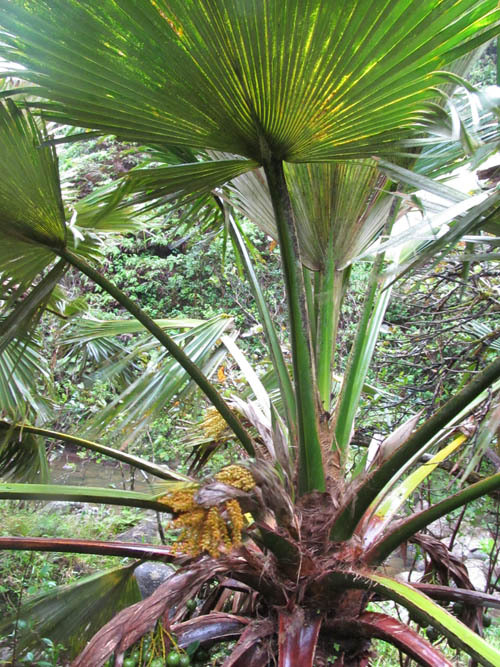 Several of the native fan palms had yellow flowers and green fruits which I have been told taste very much like coconut. When I reached the appointed turn around time, I had reached a section dominated by a form of loulu with a much taller trunk which I speculate must be a different species. I reached the furthest I could go given the time constraint and had to turn around. 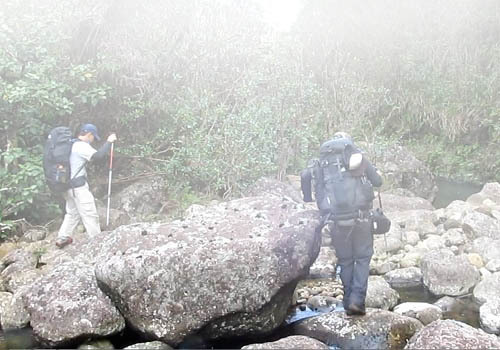 The mists became thicker as I returned downstream to rendezvous with the others. After reuniting with my hiking buddies we wasted little time climbing back up to Papali Ridge in order to generate badly needed body heat. The wind was even stronger and colder on Papali Ridge which motivated us to set a blistering pace as we made our way back out the way we had come. 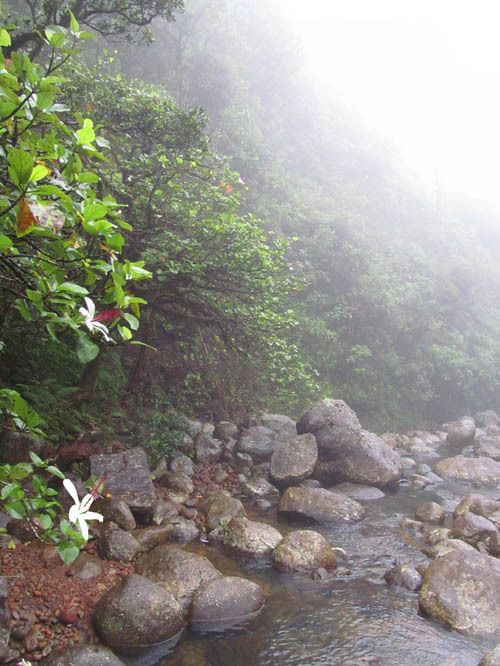 With daylight waning as we descended from ridge to ridge, I reflected on the great time we had exploring the upper reaches of Kaluanui Stream and experiencing one of few places on Oʻahu where you can explore a native stream in the clouds. What a great place to visit! Fantastic pictures Nathan! Quite a few unusual plants, animals and insteresting sights especially when you went upstream. Your packs looked like you went backpacking up there or were ready for anything. Thanks for sharing your adventure. Wow! What a beautiful spot, so great to see abundant native streamside vegetation. Thanks… we carried huge backpacks to accomodate several hundred feet of rope, spiked footwear, and other climbing gear which were needed for the waterfall part of the adventure. We also had neoprene wet suits and rain gear to tolerate the cold. And of course mulitple cameras, lenses, and tripods. Its a good thing we all backpacked mutiple times this year so were accustomed to carrying big loads. 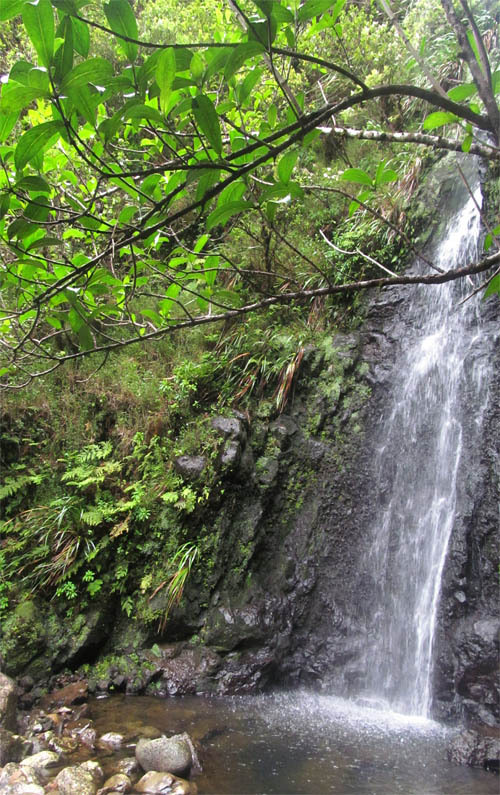 Yeah… it is indeed a beautiful spot — one of a handful of near pristine places on Oahu. I am reading all your posts since October (my previous visit to your blog) for the last couple of months. You have outdone yourself on this post- this was AMAZING! 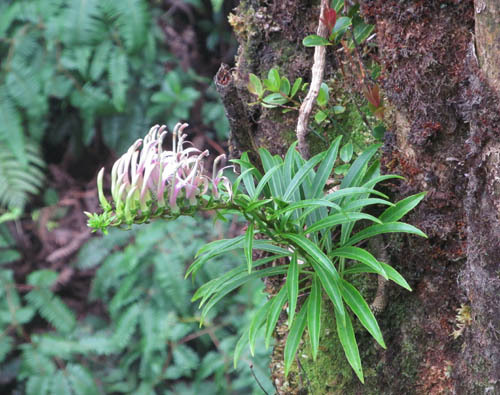 I loved the lobeliad epiphyte! I have never seen them grow that way before – I did not know they could. I love the waterfall you found! You are very good at framing them. It is hard to capture waterfalls on film. That is exquisite scenery! Glad you enjoyed this post. Love going to upper Kaluanui.